"In Gallant's stories, the conflicts, obsessions, and concerns – the near-impossibility of gaining personal freedom without inflicting harm on those whom you love and who love you; the difficulty of forgiving a cruel and selfish parent without sentimentalizing him; or the pain of failed renewal – are limned with an affectionate irony and generated by a sincere belief in their ultimate significance, significance not just for the characters who embody them, but for the author and, presumably, the reader as well." 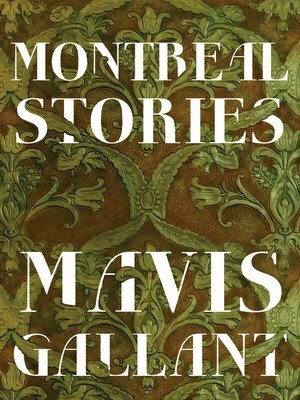 Mavis Gallant is the modern master of what Henry James called the international story, the fine-grained evocation of the quandaries of people who must make their way in the world without any place to call their own. The complexity of the very idea of home is alive in the stories Gallant has written about Montreal. Montreal Stories, Russell Banks's new selection from Gallant's work demonstrates anew the remarkable reach of this writer's singular art. Among its contents are three previously unpublished stories, as well as the celebrated semi-autobiographical sequence about Linnet Muir – stories that are wise, funny, and full of insight into the perils and promise of growing up and breaking loose.